Most people know that stress is among the list of common migraine causes, but did you know that a reduction in stress can also trigger headaches? Learn how to control your stress levels to prevent a “let-down” headache after a period of high stress. Stress is a well-established trigger for migraine. As a longtime migraine sufferer, I am never too surprised when I get headaches during periods of high stress. Stress is always on the list of common migraine causes. But what has always baffled me is when my migraines get worse when I am finally able to relax after stressful times; in the past, I have gotten headaches on the first days of vacations or on the days following college final exams. This didn’t ever make sense to me, until I learned that a reduction in stress can cause a headache just like an increase can. Stress is a well-established trigger for migraine. In fact, perceived stress may be associated with migraine onset in up to 80% of people with migraines. 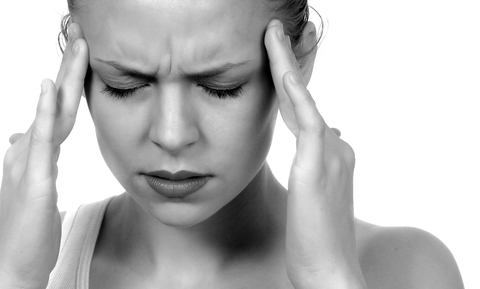 Daily life hassles as well as major life events (both positive and negative) can cause headache episodes. You may find that a single stressful event may trigger a headache, or you may find that your headaches increase in frequency or severity during a period of prolonged high stress, such as during a move, during a difficult time at work, or following the birth of a baby. Try keeping a headache journal to identify these kinds of patterns. Something that may be harder to pinpoint and harder to understand is that when stress begins to subside, your body may also react by triggering a migraine. A study published in the journal Neurology in 2014 found that a decline in perceived stress was associated with an increased risk for migraine onset. The authors of the study found that at six hours after the decline in perceived stress, the odds for having a migraine were increased by four-fold. They also found that when stress decreased from one evening to the next, headaches were likely to occur the following day. Headaches that occur after stress are sometimes called “let-down” or “weekend” headaches. They often occur on weekends, on vacation, or other times when the person is finally able to relax, let down, and escape from stressful stimuli. Although researchers don’t entirely understand why this occurs, they believe that glucocorticoid hormones may play a role. These hormones temporarily increase during stress and have anti-inflammatory and pain-blocking effects; when stress is reduced, the levels of these hormones fall, and this effect may initiate a migraine attack. Because both stress and a reduction in stress can be migraine causes, it is essential to keep your stress levels in check. This is why a variety of relaxation techniques have been shown to be so effective in migraine treatment. Try progressive muscle relaxation training, guided imagery, deep paced breathing, meditation, and more, which can all help reduce headache symptoms. Biofeedback can also be effective for helping you to learn how to induce the relaxation response in your body. Cognitive behavioral therapy may also be worth a try; it can help you to identify and modify thinking and behavioral patterns that may be negatively impacting your stress levels. Preventing stress in the first place is the best way to avoid a “let-down” headache. But when stress inevitably occurs, take all the measures you can to take care of your body. Avoid any known triggers, keep yourself well fed, get plenty of sleep, and keep up with your relaxation techniques. Do whatever you know works to keep your body balanced to avoid a possible attack. Do you get headaches when you are stressed? What about when your stress levels decrease? What other migraine causes have you identified for yourself? Share your favorite relaxation techniques for reducing migraine headaches in the comments section below. Curr Neurol Neurosci Rep. 2015 Apr;15(4):14.
anti inflammatory, cognitive behavioral therapy, headache journal, headache symptoms, headaches, meditation, migraine, migraine causes, migraine headaches, migraine treatment, migraines, muscle, pain, relaxation techniques, relaxation training, sleep, stress. While I don’t suffer from migraines, I’ve often gotten colds after periods of high stress. I imagine it’s the same mechanism. i had severe migraines several times a month all my adult life. It was so bad that i almost dropped out of graduate school Then, they suddenly ended. Only 2 things changed: a dentist removed all my old mecury fillings and the place where i worked started giving us bottled water — which i decided to use at home too. I was 38 then. Im 58 now and havent had another. Hope this provides clues or hope for someone still suffering.